Thursday, July 31: Brooks Park was packed with the youth of today shredding their hearts out in anticipation of the Natural Koncept skateboard team's demo. It'll be a while until I get some video footage online from that day, but these stills taken before the demo show some of the "personalities" of the Fredericksburg skate scene. Shout out to Mark Eyestone of Fred Skates for hosting the event and DJ Bredren for bringing some reggae beats for the summer session. Patiently waiting for the Natural Koncept van to roll through. DJ Bredren Soundsystem in effect Smithson holds his own and drops hammers all day Kinda like the lineup from The Usual Suspects if Kevin Spacey wore more clothes. Leah will be a senior in high school this year and to keep her drawing skills sharp for the upcoming year, she took the "Adult Drawing" workshop. We did a number of exercises including a full-scale self portrait (above) as well as classic sketch studies such as hand sketches and still life drawing. The major focus of this workshop is to encourage students to maintain a 'habit' of working in their sketchbooks. Creativity, like athletics, can only be sustained if it is exercised often and the sketchbook is the vehicle which allows one to continue to explore and hone their techniques. 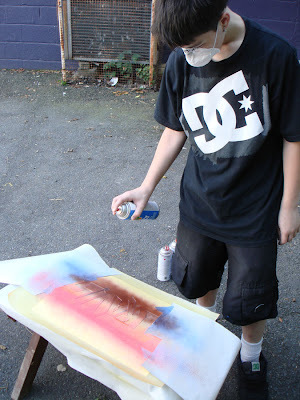 The "Skate to Create" workshop is the most popular among teens this year. I've seen a lot of great designs and met some great kids so far. July's workshop was no exception. Michael gave 110% the entire time and he managed to finish his work with some spare time for us to skate in front of the shop. Below is a sequence from his classes. 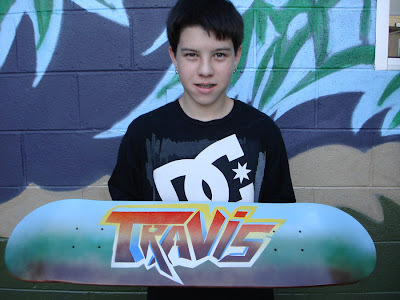 He chose to use his nickname "Travis" for his deck graphic. Applying the final layer of colors - gradient from red to brown. One happy camper - the completed deck, ready to rip! For a current schedule of classes offered at the PONSHOP, click here. I'll be offering another series of art workshops for children, teens, and adults through August and September.